President Tsai Ing-wen says the Taiwan Relations Act is crucial to Taiwan’s close ties with the United States. Tsai’s was speaking on Monday while receiving a US delegation led by former House Speaker Paul Ryan. The US delegation is in Taiwan to celebrate the 40th anniversary of not only the Taiwan Relations Act (TRA), but also the establishment of the American Institute in Taiwan (AIT). The US Congress passed the Taiwan Relations Act on January 1, 1979 to create a legal basis for Washington’s relations with Taipei. That’s after the United States switched diplomatic recognition from Taipei to Beijing. The American Institute in Taiwan is the de facto US embassy in Taiwan in the absence of official diplomatic ties. 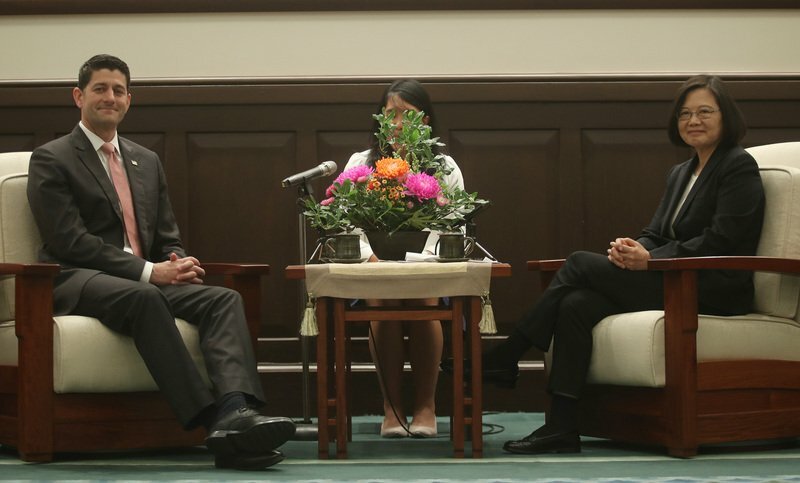 Tsai said the number of the TRA-related events and discussions both in Taipei and Washington is a testament to the stronger ties between the two sides. She spoke on Monday about the importance of the bill. "I must point out that the Taiwan Relations Act laid a very important and crucial foundation for pragmatic exchanges in the areas of trade and security between the two sides. Had the US Congress not passed the act 40 years ago, the close partnership that we have today might not exist," said Tsai. Meanwhile, AIT Director William Brent Christensen said at a seminar that Taiwan is not only America’s partner but also a model democracy. He said Taiwan shouldn’t be excluded from the international community. "Taiwan as a valuable partner and a force for good in the world has been and must continue to be a part of the story," said Christensen. He said the United States will continue to support Taiwan’s meaningful participation in the international community, adding that Washington will ask more countries to support Taiwan.